The clubhouse provides commanding views over the course, the Atlantic Ocean and the spectacular Kerry coastline. Some say the views from the members lounge at the clubhouse are reason enough to visit this wonderful course. Played here with my wife and both agreed was the best course we played in Ireland, prefering it to better known courses like Ballybunion or K Club. Definitely in my top 3 and probabaly number 1. Our company is holding a conference at the Killarney Park Hotel August 31-September 4, 2006. Could you please tell me how far you are from Killarney and how long it would take to travel to Tralee by bus. Also, what rate would you give a group of approximately 6 foursomes? Simply one of the best courses I've played. Magnificent par3:s and some demanding par4:s. The view of The Atlantic is breathtaking, esp on the 16th where the teeshot is directed towards the sea (and maybee into the wind and forcing You to carry the ball some 200 yards from the bluemarkers). We played in bright warm sunshine and a cooling breeze on a golfing oasis. The first nine were picturesque and memorable. The second nine ARE simply unforgettable for their challenge, uniqueness and beauty. However you find it, relish the local warm welcome and the creamy Guinness at the 19th. 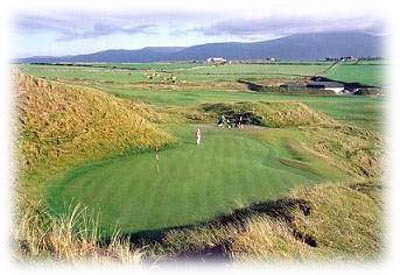 We played this course on a beautiful day in June, 2001 and whereas it was my partner's favorite of the 6 courses we played in Ireland he plays to a 15 handicap it was a bit much for me, especially the back nine which are links golf on steroids. I am a 39 year old woman who plays to a 29 handicap. The front nine were tough but playable for me, but the back nine you really need to be able to hit accurate and long irons to score, and otherwise it is rather trying. However, the back nine are so spectacular almost every hole is memorable that I really did not mind the lost golfballs and high scores. The course is a must play for anyone in the area, but it is a bit difficult to find your way there from Tralee town so leave enough time before your tee time! Simply the most picturesque and satisfying golf course on the West coast of Ireland. Not as demanding as Ballybunion, more interesting than Waterville, more testing than Killarney. Worth the journey, no matter where you live! Whilst the front nine are enjoyable to play, they are nothing to write home about. However, the back nine are superb. When the wind blows the 12th and 13th are very difficult, but very spectacular. Simply Incredible! 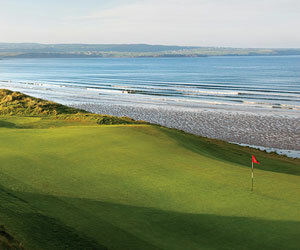 We played all over Ireland for eight days and found this to be the most beautiful and a great test of golf. Palmer had a magnificent piece of land to work with. Tralee is a marvellously scenic course. It has to be experienced to be believed. Although it was not my favourite of the 14 courses that I had the privilege of playing this past summer, it was certainly one of the most memorable. The par-3's are as tough as they come. Whatever you do, keep it in the fairways...if you can find them. By all means, play Tralee.